German cockroaches are more than just nuisance pests – they can be a detriment to human health, given the many pathogens they can carry and allergies they can trigger. To provide your customers peace of mind from these pests, it is important to understand their biology and how best to control them. German cockroaches have incomplete metamorphosis, going through the life stages of egg, nymph and adult. Depending on the temperature and humidity, it takes approximately four to six weeks for these cockroaches to develop from eggs to viable adults. An adult female can live up to 28 weeks and produce up to five oothecae, or egg cases, that have 30-40 eggs each. This means she can be responsible for producing upwards of 200 offspring in her lifetime. Treatment expectations should also be discussed with customers upfront. For example, it is common to have cockroaches for up to two weeks after an initial treatment. It will take time for newly hatched cockroaches to develop and feed on the bait. Baiting for German cockroaches has become common practice in most Integrated Pest Management (IPM) plans, but it must be understood before it can be implemented. For the best long-term results, rotate multiple gel baits with different active ingredients (a.i.s) on a seasonal basis to help prevent physiological resistance. Refer to the Insecticide Resistance Action Committee (IRAC) designation for each a.i. to ensure you are utilizing gel baits with different modes of action. Syngenta now offers three cockroach gel baits with two different modes of action. Advion® Evolution Cockroach Gel Bait and Advion Cockroach gel bait both contain indoxacarb, which is an oxadiazine with an IRAC classification of 22A. 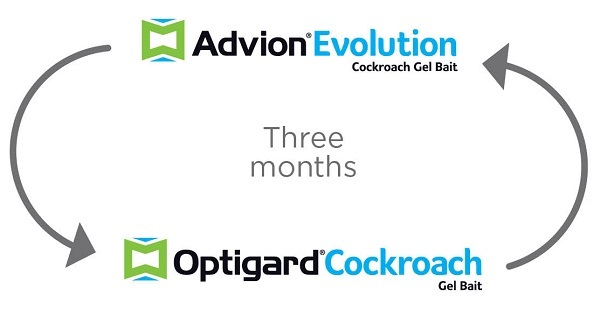 Advion Evolution, one of the most recent cockroach control innovations from Syngenta, offers an enhanced bait matrix that is highly attractive to cockroaches, resulting in increased feeding. Optigard® Cockroach Gel Bait, another recent innovation from Syngenta, has a unique a.i., emamectin benzoate, which has an IRAC classification 6 and affects cockroaches at two different target sites. These two gel baits with different a.i.s can be rotated with each other to help control German cockroach adults and nymphs, serving as powerful tools in your IPM strategy. With proper education and knowledge, you can provide your customers extended control of German cockroaches. For more information about cockroach control, visit www.SyngentaPMP.com/CockroachSolutions.